The Holiday Invitation Manager is the best tool for organizing all of your invitations that have been sent out for the holidays. When hosting a large party or event, it’s important to keep a calm head and stay organized. This template allows you to enter every guest and invitation you have sent out and monitor all of their responses. It’s hard to prepare for an event if you don’t know how many people are going to show up, and who knows when or if people will reply to your messages. Things are just bound to fall by the wayside without a way to track everything. Let the Invitation Manager be your personal secretary and help you throw the greatest holiday party anyone has ever seen! Start by entering the day of your event in the upper left-hand corner of the document. This section will be highlighted in green and read “Event Date”. In this same section, there is also a calculator for the days remaining before your event date and the number of people who will be attending. The next step is to go over to the main table in the middle of the template. Enter all of the guest names under the “Guest Name” column. Then you may proceed to enter the rest of the required information, such as: if the message was sent, has the person RSVP’d, the number of people in their party, etc. Once all your guests and their subsequent information have been listed, the template will calculate the total number of people attending the party. All this information will be conveniently displayed in the far left column. 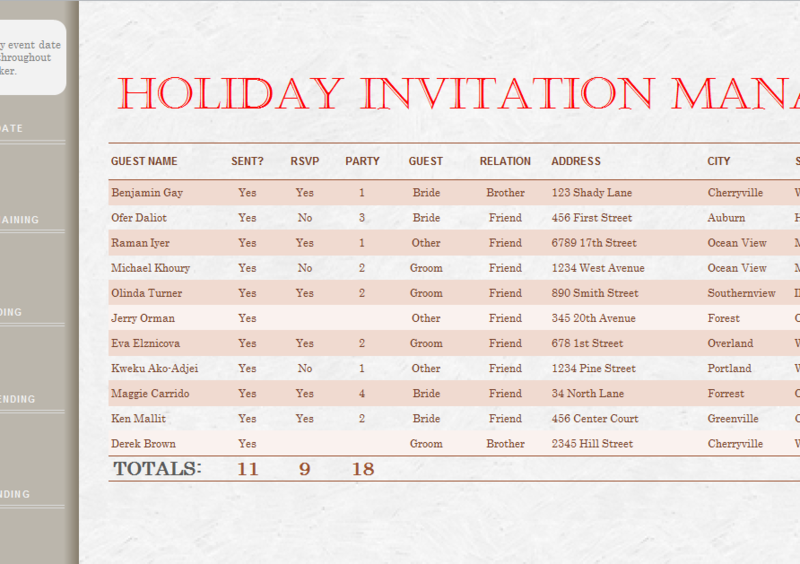 With this complete, you will have a comprehensive guest list to center around the specific details of your party! Organize the perfect holiday event with this guest list!